In this workshop, you’ll experiment with a wide range of mark-making possibilities using pencils and graphite sticks and add creative diversity to your drawing practice. You’ll explore mark-making, texture and pattern while playing around with composition, structure and rhythm. Charcoal is the perfect medium to explore depth and tone we make a tonal gradation scale and explore simple techniques useful to the medium. We look at the way other artists have used this medium before embarking on our own composition in response to the artists we have studied today. Colour is very seductive, but often tricky to manage. In this workshop you will learn some fundamentals of colour theory. We will make our own colourwheel – an important and practical tool to help manage and understand colour relationships. Learn to mix and adjust colours to assist in selecting appropriate palettes to create a variety moods in your works. An exciting and fun medium, pastels will appeal to anyone who loves drawing and colour. With their chalky texture and pure colour pigment, pastels are the perfect medium for exploring colour and bridging the gap between painting and drawing. Referencing the wonderful work of Edgar Degas, famous for his pastel drawings, we make studies of his technique and learn how both instructive and rewarding this medium can be. A beautiful and popular medium, loved by artists for its lovely fluid transparency, fresh colour and immediacy. Using a range of different approaches, we will make bold and colourful still life studies of luscious fruit and vegetables. A wonderful day playing with colour shape and composition. Continuing our watercolour journey, this class is an opportunity to continue the exploration of this colourful and seductive medium. You can work on themes explored in last month’s class, or start a new project. 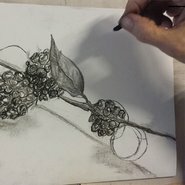 For those who did not attend the previous class, Brenda will take you through a range of techniques and a variety of different approaches using a still life study. Be inspired by a rich array of edible seafood ingredients. Construct a still life that defies its name and becomes a luscious, tempting exploration of life. Using black and coloured inks, brushes, nibs and bamboo pens, you will learn how to exploit ink’s fluid and atmospheric qualities to construct a still life designed to appeal to all the senses.